Sister Mary Ripp, S.C.C., principal of Our Lady of Port Richmond Regional Catholic School, welcomes guests to the scholarship awards presentation. 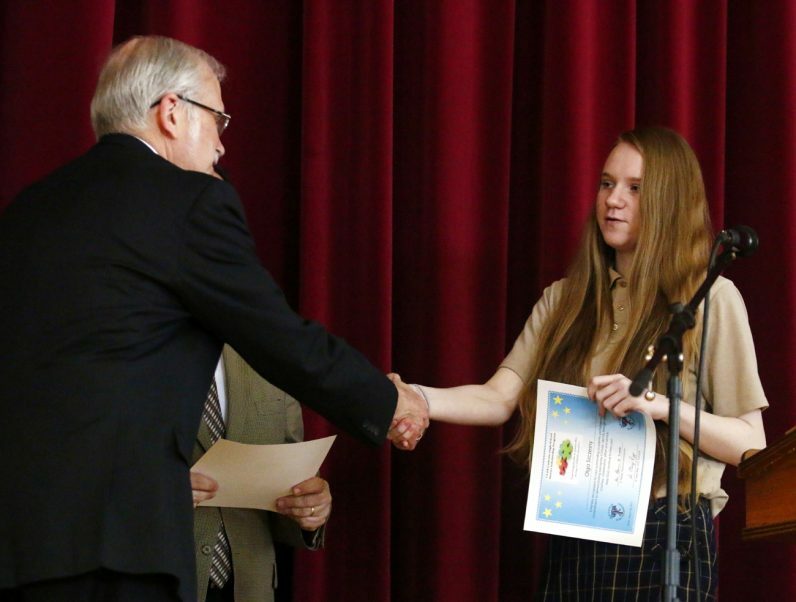 Larry Rasbach, assistant principal for academic affairs at Little Flower Catholic High School for Girls, congratulates Olga Szczesny on her scholarship award. 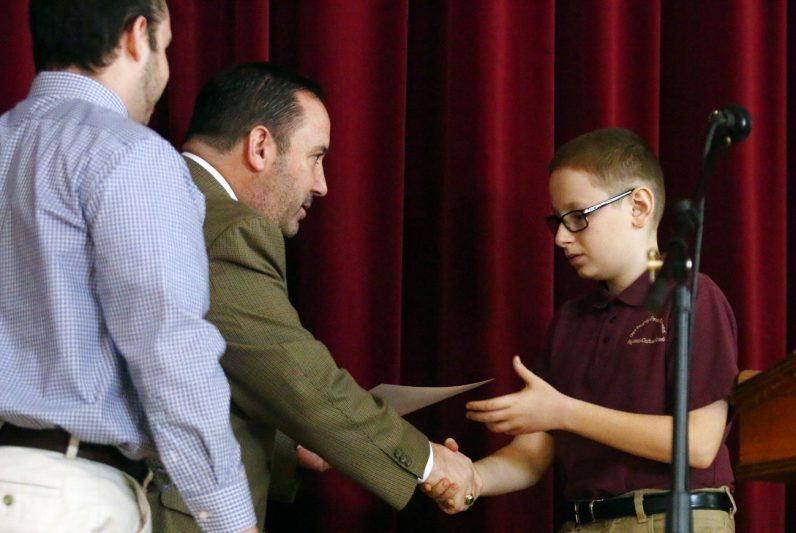 Adam Gault, director of admissions and communications at Roman Catholic High School for Boys, and Chris Mominey, Secretary and Chief Operating Officer for Catholic Education, present James Brown with his scholarship. 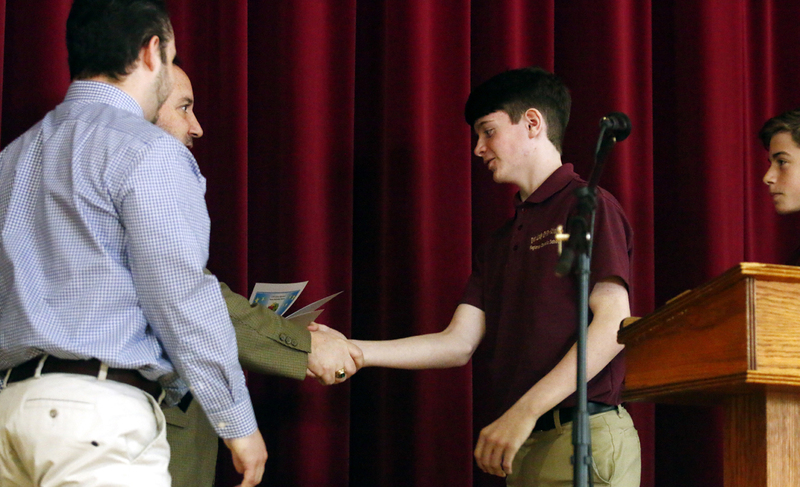 Our Lady of Port Richmond eighth grader Janusz Kowalski receives his award from Adam Gault of Roman Catholic High School and Secretary for Catholic Education Chris Mominey. 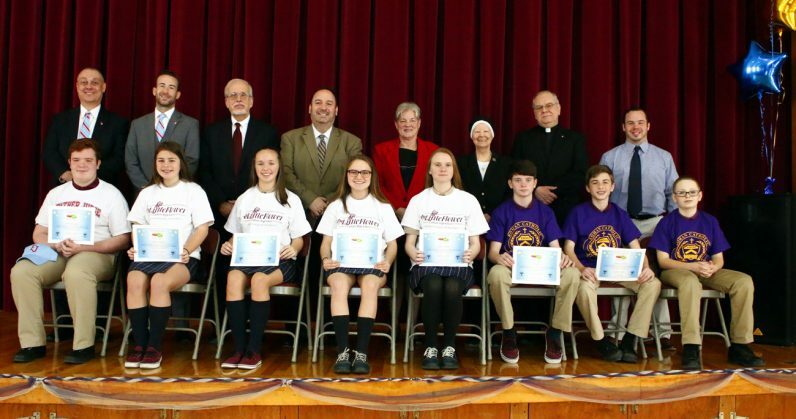 From left, Abigail Galazka, Alayna DeNight, Emily Dillon and Olga Szczesny don T-shirts showing they’ll be attending Little Flower High School next year. 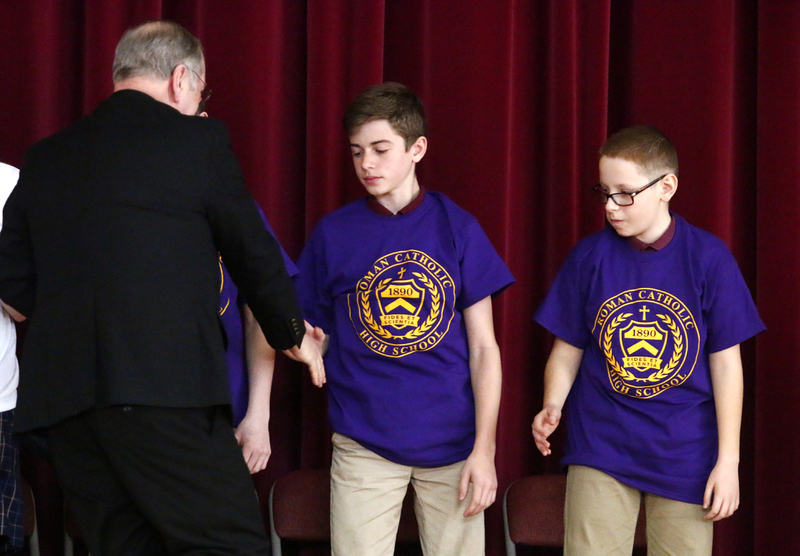 Father Dennis Fedak congratulates James Tammaro and Janusz Kowalski who will be attending Roman Catholic High School next year. 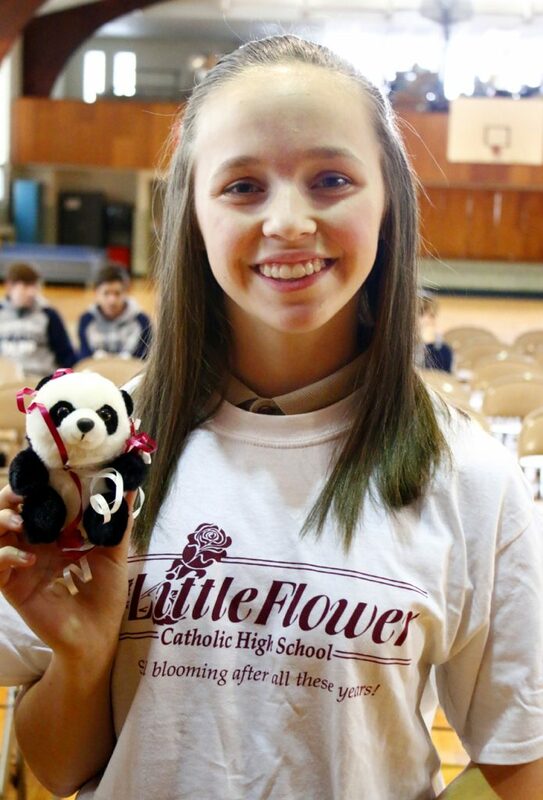 Alayna DeNight shows off the panda, the mascot of Little Flower High School, which she received with her T-shirt. 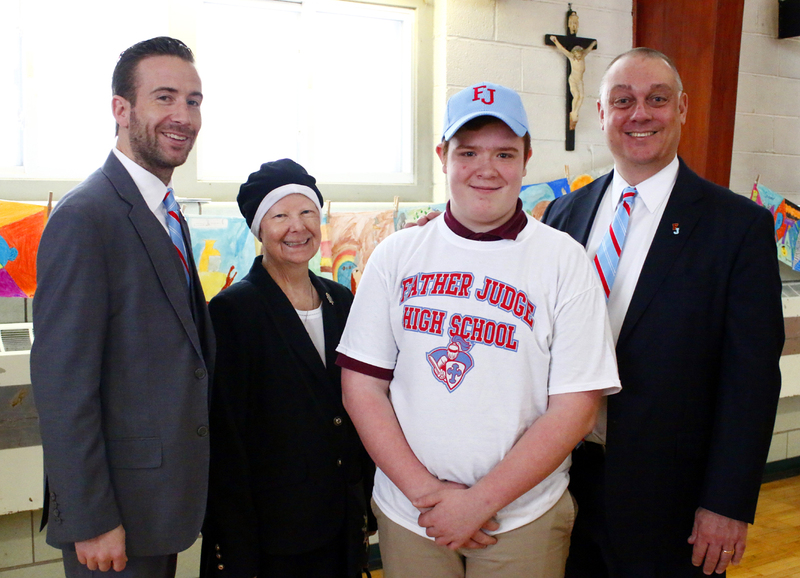 Posing at the announcement of the scholarships are, from left, Brian Patrick King, president of Father Judge High School; Sister Mary Ripp, S.C.C., principal Our Lady of Port Richmond Regional Catholic School; Michael Helder, scholarship recipient; and Mark Gudas, director of admissions at Father Judge High School. 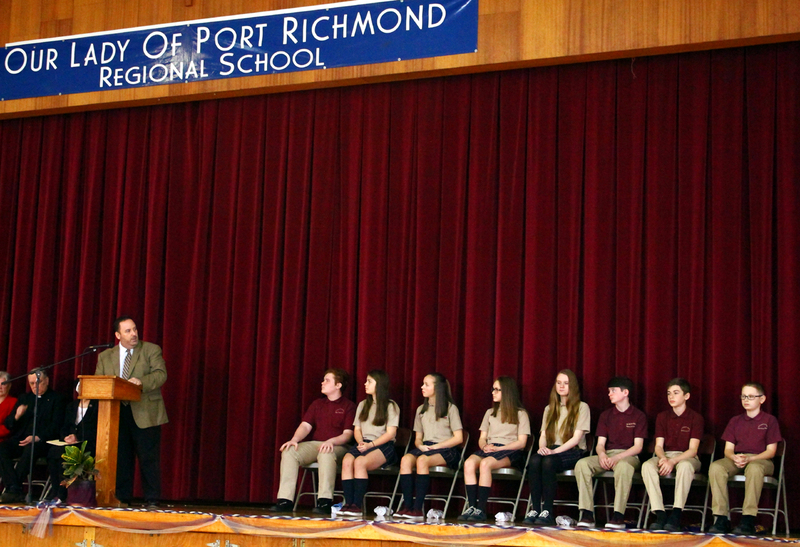 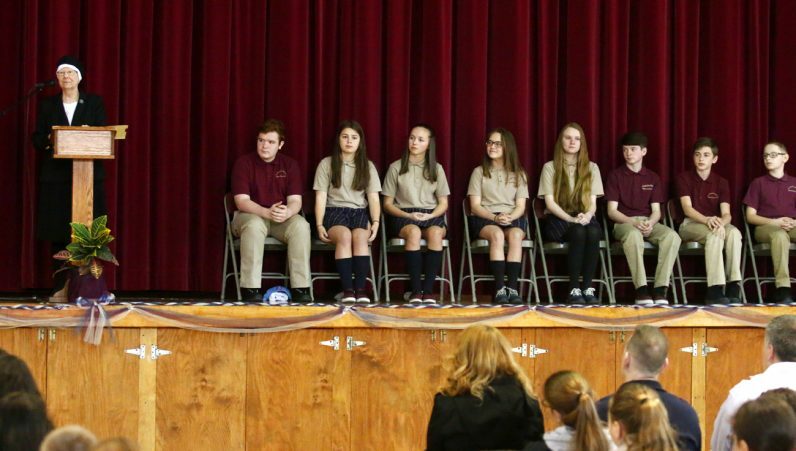 Chris Mominey addresses the scholarship students at Our Lady of Port Richmond Regional School, Philadelphia, March 30.